Exhaust manifolds can either be a cast iron, factory-type manifold or a tube steel header typically used in performance applications, though they are becoming very common in OEM applications. There are a variety of reasons for coating an exhaust manifold header. #1 Corrosion protection. The manifold will live longer as well as look nicer. 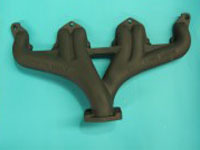 Whether it is for performance or show, coating an exhaust manifold is valuable to you. #2 Thermal protection. 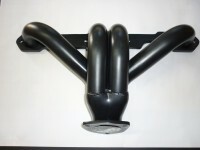 The coating is a thermal barrier, thus keeping heat within the manifold or header. There are a number of benefits for this. First, by keeping heat within the manifold, you’re going to accelerate the exhaust gas velocity which reduces back pressure and reduces fuel contamination due to reversion. This is a performance benefit. Second, you’ll reduce the surface temperature of the manifold. This means if a person comes in contact with it, they are less likely to be burned and leave skin behind. If there is a component close to it, it will not see as much heat as it would with an uncoated manifold. In addition, not as much heat will be radiated under the hood or into the engine compartment. This reduces the underhood temperature which, again, reduces the temperature of surrounding parts, such as, alternators and starters. It also reduces the amount of heat that can be drawn in through the carburetor, which is a secondary performance benefit. There are a variety of coatings that can be used on exhaust manifolds or headers. 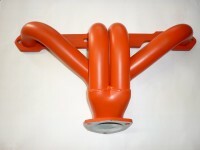 Exhaust Manifold Coatings – The most popular is our Ceramic chrome. This gives a near-chrome finish, tremendous corrosion protection and is an excellent thermal barrier. On the stock side, our Cast Iron is extremely popular, especially with restorers, since it imparts an original, dark cast iron appearance rather than the lighter appearance that is more typical of a bead-blasted finish, which is not truly stock. Both of these coatings have good thermal stability and are good thermal barriers. We recommend that on cast iron, due to its porosity, a base coat of Ceramic chrome be put down first, then bake. For tube steel headers, you can use our Ceramic chrome over a base coat. In most cases a single coating is acceptable. We also manufacture an insulating base coat for performance applications. 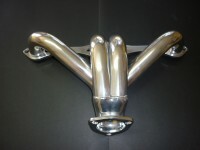 This can be applied to the outside of the exhaust manifold or header, cured, lightly sand blasted, cured and polished. This will impart higher temperature capability allowing it on 9 to 1 motors, which typically have an extremely hot exhaust gas. The end result of a coated manifold or header will be better performance, better appearance, reduced corrosion which means long-term improvement in appearance and will reduce component and underhood temperatures.